Last week I had the chance to check out some of Vancouver's Robson Street near BC Place after doing some work. 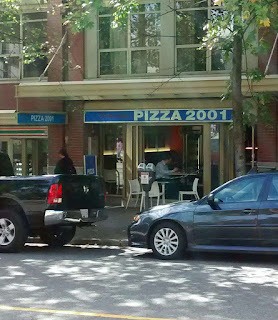 Despite having pizza the previous night, I decided to try out some of Vancouver's more Mom & Pop style pizza shops. I selected Fantastico Pizza 2001 (320 Robson Street, Vancouver) which had a couple of seats outside on the sidewalk and open sliding glass door. The interior seating has a couple of large long tables that permit either a large group to use or more communal seating. Being tight for spice in a downtown urban location, most of the seats are utilized for individuals to grab a slice and find a drink. 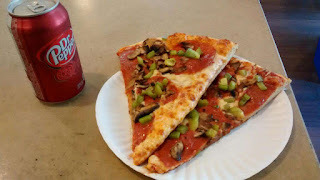 I visited the counter where customers can order any two pizza slices and a soft drink for $6.25. Not bad considering I'm used to paying $5.00 for only a single pepperoni pizza slice and a drink back home in Ottawa. The Order: Two Deluxe Pizza slices and a Can of Dr. Pepper. After ordering and paying, I found a seat and sat down two spots over from a lady engrossed in a book while slowly munching on a pair of slices. I dug into my Deluxe Pizza slices to be fairly impressed. A decent amount of reasonably fresh toppings on a thin New York style pizza crust. Instead of a crunchy pizza crust, the crust is a more traditional doughy texture. Service here is a little questionable. The lady I ordered from I could barely understand when I asked if the combo came with a can or bottled soft drink. I had to ask two times before I made out "can" in whatever she was saying. Perhaps she was filling in for the day or perhaps this was her regular spot as one of the owners of the small business, I'm not sure. Overall, for a quick slice or a bite to eat Fantastico Pizza 2001 quality is pretty good. Tucked in busy section of Robson Street, this restaurant has a prime location being just a hop skip and jump from from BC Place. But with this easy access comes a downside, seating is at a premium so during busy times expect to have to look elsewhere for seating. If the food quality continues to be as good as I experienced, Fantastico Pizza 2001 will remain a Fantastico place for pizza for a while to come.